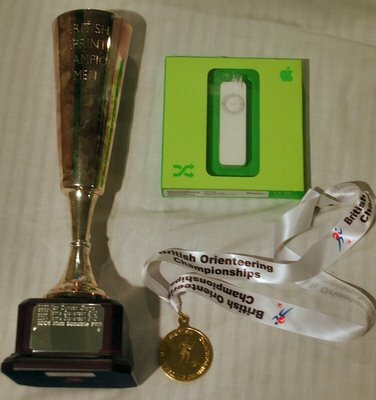 I have to concede my UK Cup title, my Scottish title and my aspirations at reclaiming the Scottish Relay title (actually the chances of reclaiming that were slim to non-existant anyway) as I have been sick since Tuesday. I should have known it was coming really, I have been illness free since before the winter. The last time I was sick for more than a day or two was back at the World Cup in Italy. For me that is almost unheard of. Stringing together more than a month or two training without getting ill has been a dream for me since I started training. I have never had a great immune system, and I missed years of school with serious illnesses, but over the last few years I have been improving. Since graduating especially I have been very healthy which I put down to a healthy diet, a good sleeping pattern and a good lifestyle with plenty of relaxation. 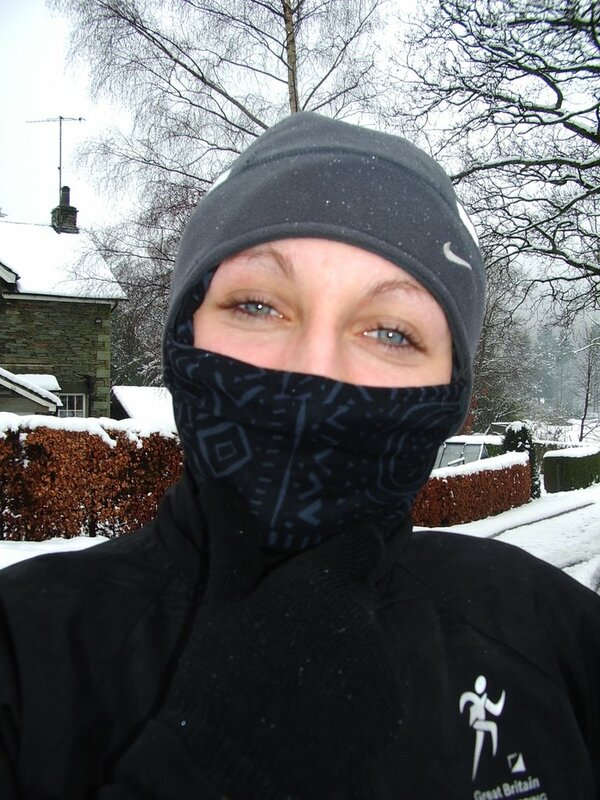 I woke up on Tuesday with a plan to run first thing, then take part in a trail challenge in the evening, but when I woke, I could hardly breath so I went straight back to bed. I thought catching it early would make the difference and I would get over it quickly, but I didnt sleep very well Tuesday night and woke up feverish and drenched in sweat. 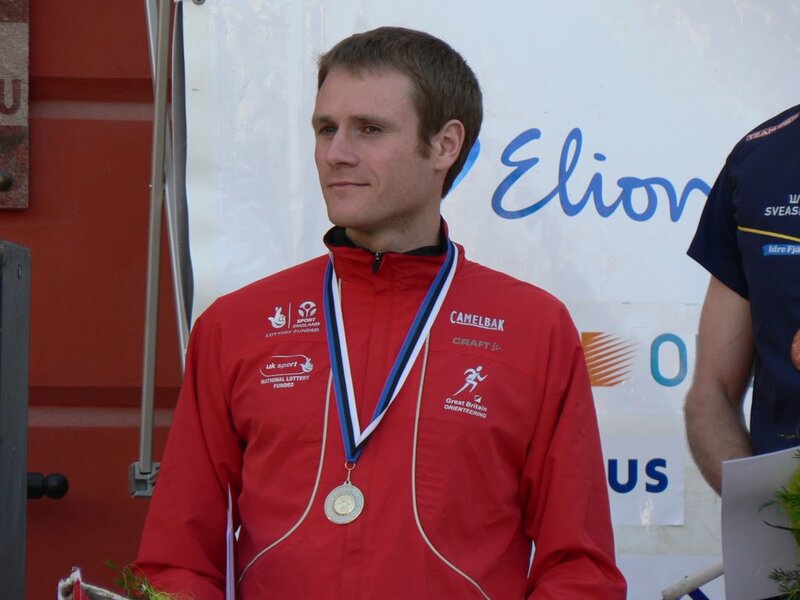 I am starting to feel better now, but I have cancelled my trip up to the Scottish Champs in the hope that I will feel better for next weeks training camp in Slovakia for the World Students. I should be in the team for that competition after my good Spring season. 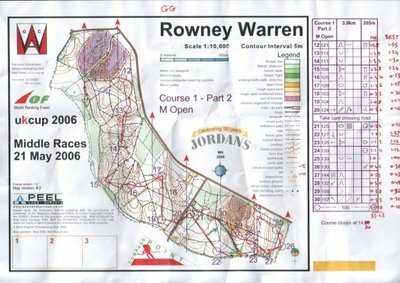 Middle distance UK Cup and World Ranking Event at Rowney Warren today, and second place for me, 12 seconds behind Neil Northrop. Well done to Neil for a great run, but I am a little bit disappointed with the result. I had a good run, and looking at the splits, I made one route choice mistake, and 3 small wobbles. Both Neil and myself, as well as Nick Barrable and Rob Baker were all running about the same speed, and it looks like Neil was the cleanest round today. The results also make the UK Cup standings very interesting. With 6 races to count, I have 3 victories and 2 second places. Neil has 4 victories, a 2nd place and a 5th place. There are only 2 races left in the series, and I am only running one of those races - next Saturday at the Scottish Championships. If Neil wins either, he has the title. I need to win next weekend and hope that Neil does not get a win to retain my title. I felt good and was running strongly all the way round. If anything I was overconfident and took no chances, choosing to rely on the mistakes of others or superior fitness. This obviously proved to be a mistake as I was running no faster than the others and actually made more mistakes. A good lesson learnt today - I still have to push these races if I want to win - but again well done to Neil who deserves the reputation he is building at the moment. Hopefully he can do it in the important races and get into the GB team later this year. 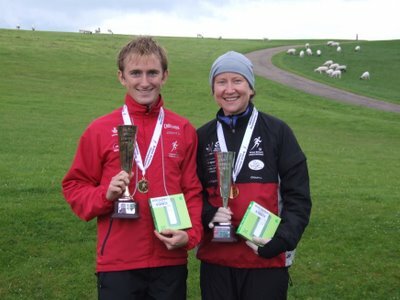 My first individual senior British title. 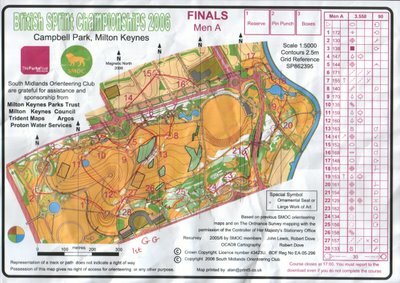 The weather may have been awful, but the British Sprint Championships was a great competition in Campbell Park in the centre of Milton Keynes. You could imagine on a bright sunny day the park might have been filled with members of the public and spectators, but unfortunately there were showers on and off all day. This meant most people sheltered in their tents and cars for as long as possible. The races themselves made very good use of what could have been very limited urban parkland. The heats and final used different parts of the area, with a common last section and finish. 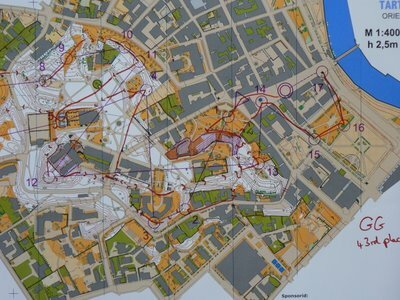 The heats took us through an urban area, with some high speed route choices through built up areas in and out of small parks. Then there was a short run along the canal under the main road and into the main parkland for a control pick through an area of woodland with a complex park network. My qualifying run was very good. Taking no chances I ran hard, and with only a small miss at number 4 (about 6 or 7 seconds), I had an almost flawless run technically. I read all the detail well and really enjoyed the course. I caught up Dave Rollins one minute at around number 17, having seen him as early as number 10. The final was quite different, with 28 controls crammed into 3.5km there was very little time to plan ahead and constant map contact was essential. Again I ran a very good race. I ran hard from the start, and tried to read as much detail as possible all the way round. 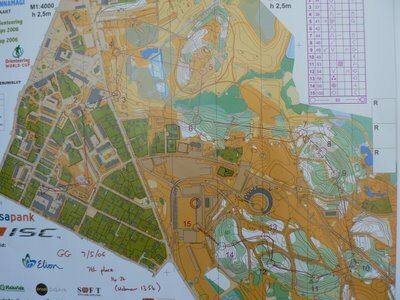 The course was very well planned and very challenging, with loads of changes of direction, cross overs and some good route choices. I had a small moment of doubt on the way to number 3, when I passed through a gap in the hedge only to find an impenetrable wall of undergrowth in front of me. On the way to number 8 I caught sight of Duncan Archer, my minute man, and I gradually reeled him in and passed him on the way to number 17. He basically decided my route choice for number 12, as he went straight over the top and I was chasing him. Nick Barrable went round and lost time. As I ran into number 12, the spectator control, they announced I was in the lead which was nice. My largest problem on the course was actually how wet it was. My choice of footwear (Adidas Swoops) lived up to their reputation of having very little grip of flat wet surfaces, and I virtually had to skate along all the footpaths. This was a major problem on the way to number 17, and I almost ended up in the hedge on a couple of occasions. 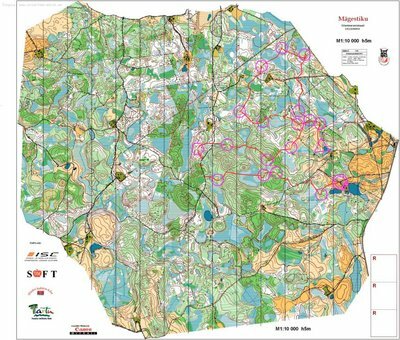 The last section of the course was perhaps the most dangerous, through the complex woodland that we had already encountered in the heats. It was here that I had my only time loss. At number 21 I failed to identify which area of woodland was more dense than the rest, and ran straight past the control. Not a huge mistake, but enough to let Duncan almost catch me again. I was clean through the last section and I could tell from the commentary that as I approached the finish that I was going to take my first senior national title. Well done to the organisers for a really enjoyable competition. The only sour note to the day was that as soon as I finished the race I was whisked off to be drugs tested along with a selection of other competitors. It is a necessary part of the sport but that does not make it any more enjoyable. Congratulations to Tess Hill who has been selected for the GB JWOC team. I have been working closely with Tess over the winter, helping her with physical and technical training, and helping her to plan her season. She will be going out to Lithuania on a pre-JWOC camp shortly, and then JWOC is in July. Well done also to Iain Embrey, who I also work with at Warwick university. 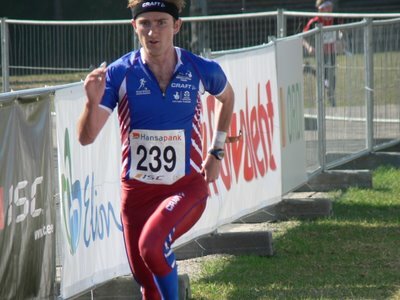 Iain has been selected as a reserve for the JWOC team. Ran a steady pace, not too many mistakes, and pushed a bit harder at the end. Never really ran at my maximum as was slightly afraid to hit the wall, so maybe should have pushed a little harder (although I'm not sure I could have really). Was caught by an Estonian guy and couldnt get away from him - every time we took different routes or I pulled ahead he caught me again. Caught David Schneider, got away from him, let him catch me again and finished with him. 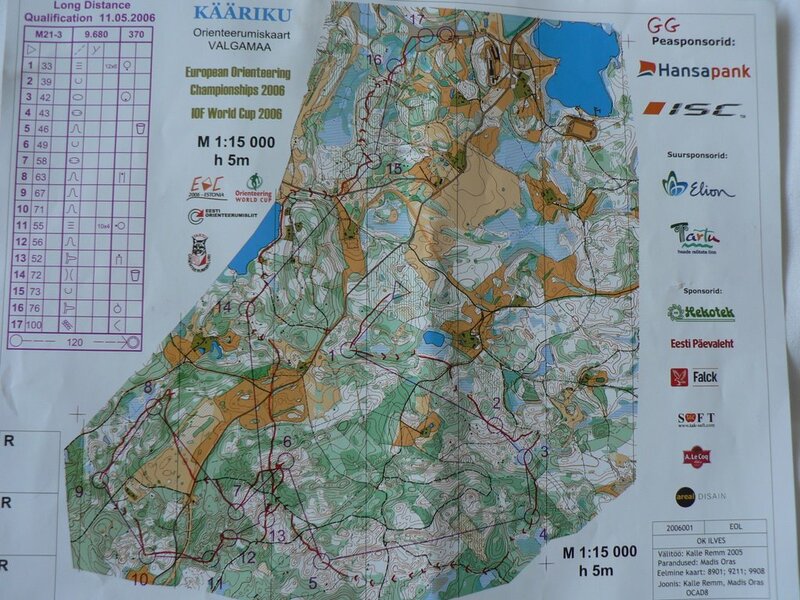 The course was long and tough, the forest was very green and quite vague in places. Supposedly quicker than winning times due to dry marshes turned into a bit of an epic with only a few people breaking the 100 mins mark in the mens. Oli, blew 4 mins at first 2 controls, then turned it around and had a really good race. Relay tomorrow, I'm running team 2 leg 1. 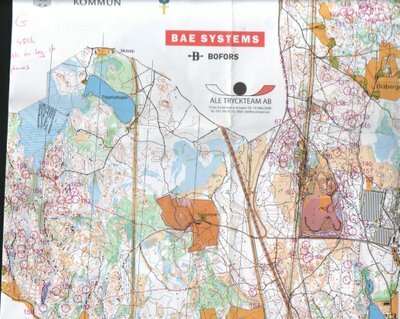 A strange day - another green Estonian forest, loads of people making plenty of mistakes, most of the British guys through and most of the girls out. Before the race, we had a fair idea it was going to be tricky, green and slow at times, but we had no idea that it would be almost impossible to be clean and to run quickly. Started well, spiked the first two. Number 3 got really confused - the marsh was really dry and got nervous so went out to path, hit control cleanly from there (lost 1 min 45 secs ish). Hit 4 fine. 5 was a tricky route choice - which path the take? Go right and nice route out to the path but more difficult to hit control, or left - a bit further but nice line in. I chose the nice line in and got a really good split. 6 was ok, but found another gaffles control in a little re-entrant just west of my control. Slight hesitation but relocated quickly (lost 30secs). 7 was fine. 8 was scary looking - no easy way in or attack point or features to relocate - and so it proved. Easy to the edge of the field, then plunging into the unknown. Headed slightly too far left, relocated on the big reentrant and lost roughly 2 mins - and I was nowhere near the worst. Some people lost 10 - 20 minutes on that or a similar leg alone. 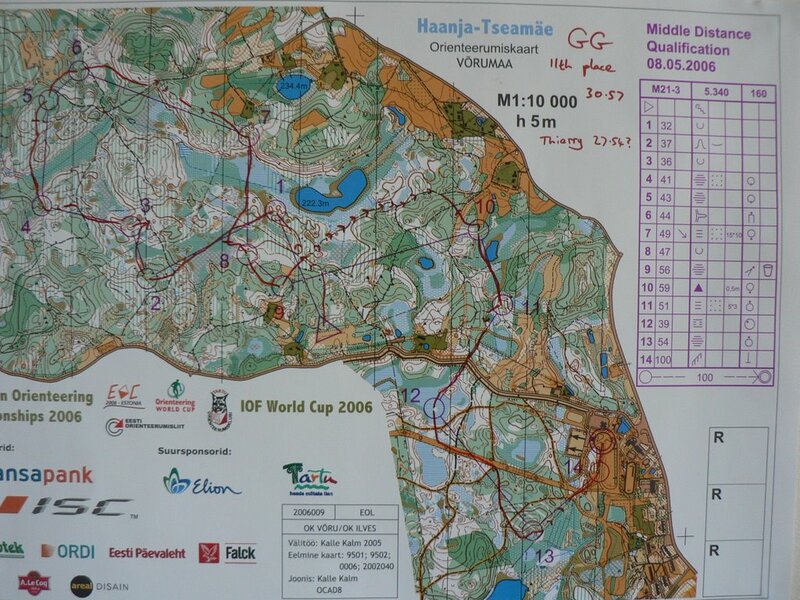 By this stage Carsten Jorgenson had caught me 4 mins and was running a slightly different line to number 9. Punch 9 about the same time and lead him and Novikov (who had caught me up 6 mins) into 10. We run together to 11 but I am in the lead, I make a small parallel error into 12 and lose 20 secs by diving off the spur the wrong way. With Carsten and Novikov disappearing into the distance I put my foot down for number 13 and proceed to banana the control proper style. Slightly off on my direction and end up hitting the path. Not a disaster and lose about 15 seconds, but they are away. 14 I put my head down, and follow my compass north ignoring all the contour detail. The plan is to leg it to the field and relocate there. As I come out into the field I see C and N again in the distance. Spike the control with a nice line in, and as I leave 14 (I havent really finalised a route choice for 15) I see them not too far ahead running towards the lake. That swings it for me and I leg it to catch up with them. Have picked up Rob Baker by this point too and we catch C and N and a Finn on a different gaffle. Control is easy. 16 is slightly messy with paths all over the place and people running everywhere. Am slightly wobbly but no real time loss. Run hard into the finish in a line of people. 4 of the last 5 legs I have top 5 splits for my gaffle. Have to admit that after I was caught 6 mins I thought my chances of qualifying were slim, but I ran a good race after that and when I finished I was 3rd or 4th on my heat. I ended up in 11th. 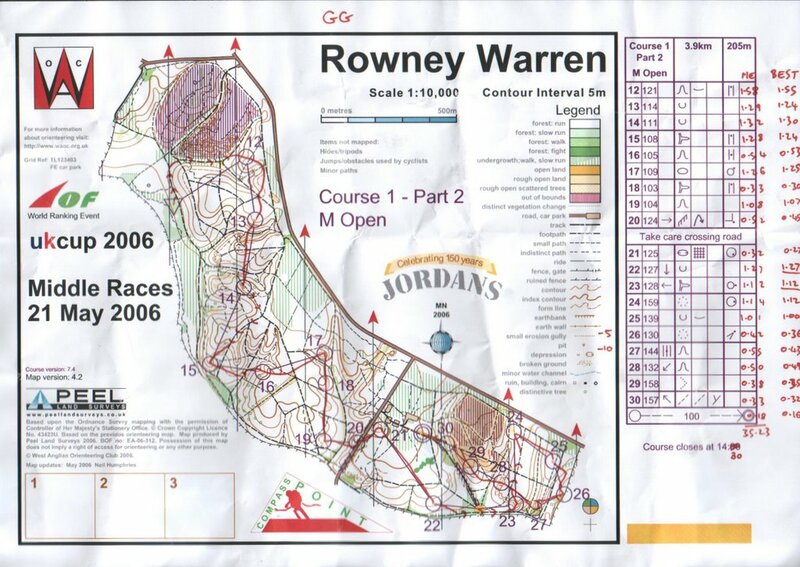 Not a great race, lost maybe 5 minutes which in retrospect was just about ok. Was running at good pace and orienteering well for most of it - better than in the races so far this week maybe. I certainly wasn't rushing so much and my mistakes were genuine misunderstandings of the map or running slightly off my line rather than rushing things. Some general disappointment in the British camp. Jamie, after his medal on Sunday, came into the race with a lot of confidence and expectation, but lost 2 minutes at the first control. Oli, Mr Middle Distance, ran a reasonably clean race but lost time after the spectator control by crossing the wrong track and doing a quick loop in the wrong block of forest. The girls were all scrappy, and with Rachel still suffering from hayfever, the results reflected that - not awful, but not as good as we would have liked. I was pleased with my run - only 3 and a half mins down on Thierry, but down in only 35th place. I ran strongly, made a couple of mistakes, and would have expected to be slightly higher which is indicative of how strong the competition in these European Champs really is. Still, some World Cup points in the bag which is more than can be said for the sprint (top 40 get points). Started quickly and just lost direction crossing the marsh just before the control. Hit the left side of the marsh and just followed it round. Nothing disastrous, maybe lost 10-15 secs. Hit two nicely, get slightly confused on 3 crossing the spur and small hills - the green doesnt quite seem to fit but I look round and see the control so OK. Spike 4 and 5, get slightly confused by the green / semi-open area on the way to 6 and get pushed slightly left but recover and hit the control nicely. Come out of six slightly too far left and find myself in the marsh but no big problem, correct myself and cross the small hill into the control. Hit 8 perfectly and leave the control towards 9. Never really get my direction right on this leg, end up straying down the hill and being able to see the lake. Don't panic, but keep running trying to get direction. Probably still running off line but pick up path and then relocate at junction. Control is easy from there. Lost maybe 1min 20secs. 10 is fine, although it seems further than is shown. This might be because I have slowed down to look at the next leg. Pick the obvious straightish route as no path routes jump out. Try to run the leg hard but lose concentration slightly and end up running to the right of the hill instead of to the left. Thats fine, and go into the control well but get distracted by a multitude of photographers in front of and around the control. I know I am right because they are there, but I can't see it at first and panic slightly, but regain control and find the control behind them. Easy legs in and out of the spectator control. 14 is fine, 15 I am really happy with, read everything on the leg and ran quickly. 16 was really good too. 17 I hesitate about the route choice, but settle for the easy option. Fearing I might miss the open area I head to the right, but I needent have bothered as it is really obvious. Spike this control and sprint into the finish arena. 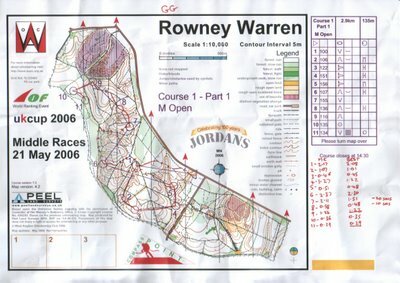 A reasonably good race, small wobbles at 1,3 and 11 and a mistake at9. Time loss between 1 1/2 and 2 mins. Rest day tomorrow with the long and relay model. Qualifying race for the middle distance today. Ran a reasonably good race, a small mistake at number 3 (30 secs) and a small mistake at number 8 (15 secs). Lost a little time on number 13, but ran the rest fairly cleanly and quickly. Happy with my race and especially with how i dealt with the little wobbles. Oli, Jamie, Jenny, Claire and Rachael also qualified. Helen didnt run as she has a cold. Pippa and JD just missed out and Rob and Craney were a little further down. Craney didn't feel too good and made a couple of big mistakes. Jamie came away from the European Champs Sprint race with a silver medal today, closely behind Emil Wingstedt. The race was fantastically close - every second really did count. There were 36 men within one minute of the lead so small mistakes were really punished. Jon Duncan managed 38th place, and I was 43rd. Jon was losing a little bit of time on every control and I blew numbers 2 and 4 to lose the best part of a minute. After 4 I had a really good race but the damage was done. Girls did well too, Sarah was 18th, Jenny 37th, Rachel 39th and Helen 44th. Sarah was really happy with her run - no mistakes, just a little off the pace, and the others lost some time in places. Pippa won the b final comfortably. The non - runners enjoyed the sunshine, the opening ceremony and some ice creams. Quick summary of my race. Took it steady to number 1, looking ahead for the route choice to 2. See the OOB area, think to myself, OK left or right - right looks nicer way in to control. Start running right. BALLS ! no way through where I thought there was. Panic - mustn't stop running - OK take left route - haven't planned that route - aaah where am I ok relocated on the road, have to climb up to control. Lose 20-25 seconds. Number 3 fine - OK 50-50 route choice again left or right of the building. Choose left. DAMN NO GAP THROUGH FENCE - panic (should stop realise route still viable, go down to road, under bridge etc...) - ok keep running, every second counts - up the massive bank, ok i'm on the bridges - want to be down there, back down massive bank, across the parkland and into the control. Lose 20 - 25 seconds. Leave number 4, see my 1 minute man running towards control. Have almost been caught - ARSE. OK get it together. Spike 5, 6 (route to the left better in retrospect? 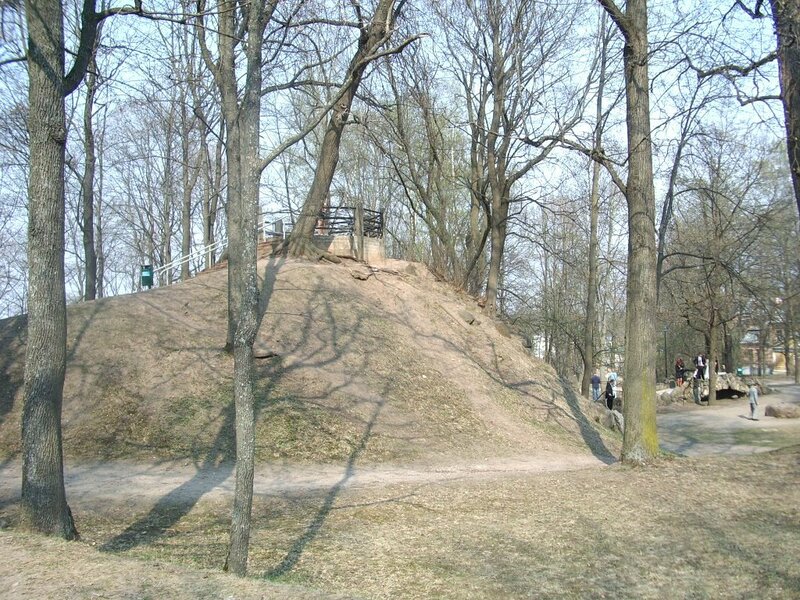 ), 7, big climb to 8, Latvian Sirmais right behind me. Clean through 8, 9, 10, 11. Number 12 Sirmais takes route through the church and just gets ahead of me for the first time. Punch 12 just behind him. 13 he runs down to the road, under the bridge and round to the left. I chose a straighter route and get to the control with him. Race across to the spectator control but am tired and lacking motivation. Try to stay with him round last easy section of course but don't quite have the legs or motivation. Cross the line 80ish seconds down. Could have been very good. From 4 onwards was very happy - comes down to 2 critical bad decisions leaving 1 and leaving 3. This could be down to rushing - built up pressure, expectation, nerves - or maybe not looking closely enough at the map and making assumptions and taking risks. Essentially though I didn't deal with the mistakes well enough - i should have remained calm, taken my time and stopped to look at the map and analyse my options instead of headless-chicken mode. Lot of positives despite this. Two poor decisions - 50-50 calls which didnt pay off. Apart from that a really good race technically and was strong physically, even if I was struggling on the climbs. 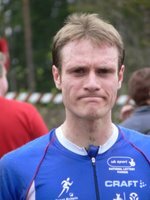 Was 46 seconds down on Emil Wingstedt at number 4, and finished 76 seconds behind, so was only 30 seconds down over the rest of the course which I am happy with. Middle qualifiers tomorrow - and there is a lot of confidence in the team. Hopefully all 12 to do well. A mixed morning for the British team with 7 of the 10 athletes qualifying for this afternoon's final. 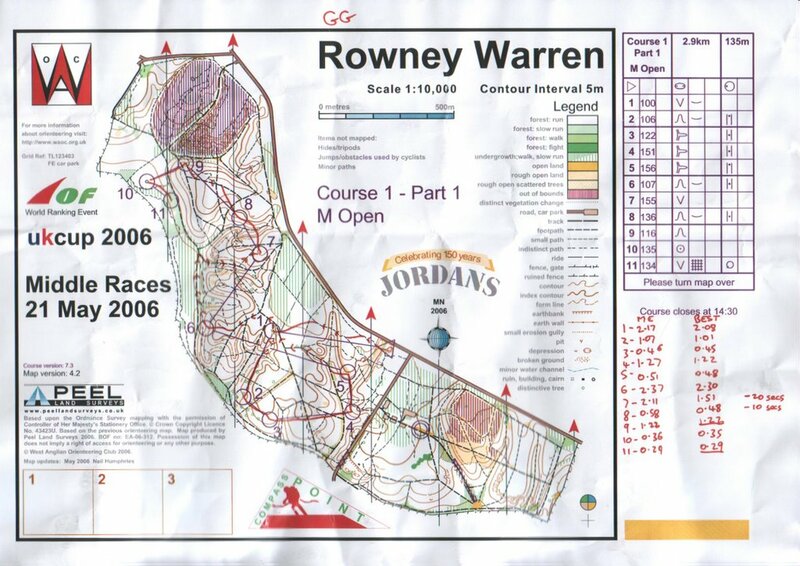 The terrain was very hilly and fast, and with relatively little route choice it was all about hitting the controls cleanly and quickly, and running very quickly when possible. Starting in the town, the first 2 or 3 controls were like an urban sprint, and then it moved into some marshy hilly edge of town parkland. One massive climb on all the courses around 1/3 of the way really sorted the men from the boys (have to admit i was reduced to a walk by the top), and the rest of the course was no let up to reduce the lactate levels with short sharp climb after short sharp climb. The thick forest was runnable but tricky, and there was a plethora of paths and fields in between offering good runnability but possiblities for parallel errors. The finish was in a ski-stadium. Pippa was the unlucky girl, missing out narrowly in heat 3. Jenny was also living dangerously, qualifying in 17th spot. The others, Sarah, Helen and Rachel qualified more comfortably. In the guys, comfortable qualifying spots for Jamie (8th), JD (7th) and myself (7th). Craney and Rob missed out, but not by a lot. Craney was only 61 seconds down on the heat winner but down in 20th place which really shows the quality of this European Championships field. 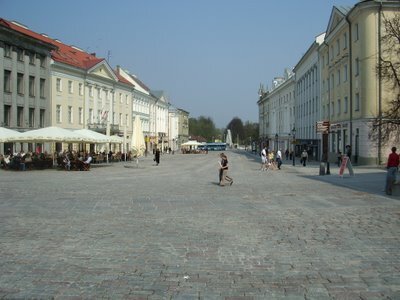 We are all back at the hotel recovering, stretching and eating before driving up to Tartu for this afternoons race. The opening ceremony and opening races of the European Championships are tomorrow, and all the teams today took a look at the model areas. These are the final preparation for the competition, allowing the athletes a final training session using the most relevant areas and the most up to date (and similar to the race) maps. This morning we went to the middle model area, a mixed forest with lots of blocks of woodland with variable runnability separated by marshes, open areas and tracks. 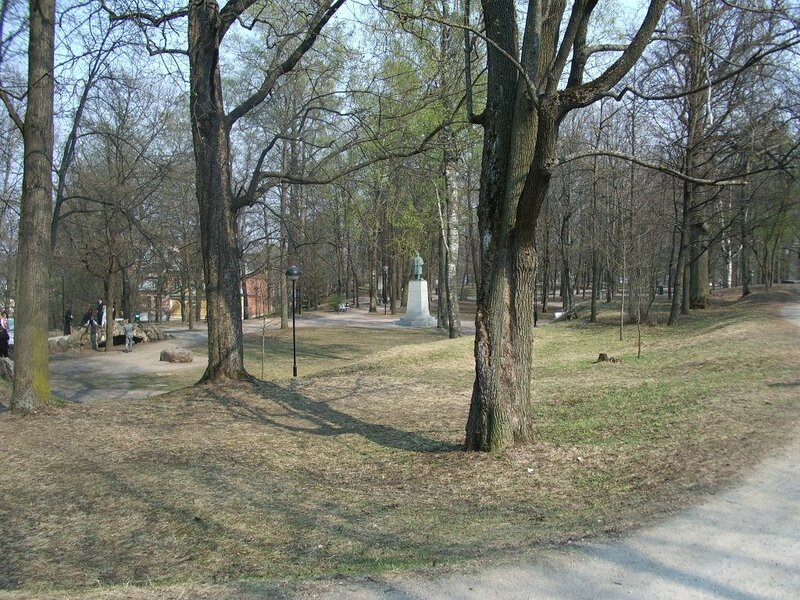 This afternoon was the sprint model, with mostly open parkland and white woodland on the edge of the town Ottepaa. Tomorrow sees the sprint race qualifier in the morning, held in and around Ottepaa, and the sprint race final in the afternoon, which is being held in a park in the centre of Tartu (the largest town in this part of Estonia). The qualifier race will see 3 heats of men and 3 heats of women, and the best 17 from each heat will go through to the A final in the afternoon (and then the next runners to the B final if they chose to run). The top 40 in the final will score World Cup points. Oli Johnson and Claire Ward will not start the races tomorrow. Oli is resting for the middle and Claire is looking after a possible injury and doesn't want to race on a hard surface at this time. The British team arrived in Puhajarve last night in time for a quick run/swim before dinner. We flew into Tallinn, and then drove for about 3 hours to our hotel, which is near Tartu in the South Eastern part of Estonia (quite close to Polva where JWOC was a couple of years ago). We are staying in a very modern looking Spa Hotel, with internet access and everything. I will try and give updates most days about what is going on in the British team. 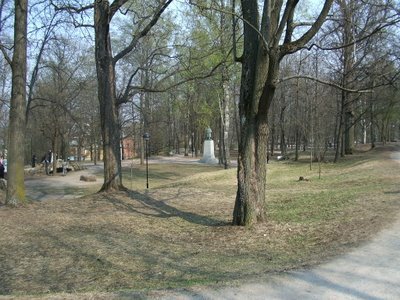 This morning we went for our first team training, and this afternoon we walked around Tartu, and had a look at the area for the sprint final (which will be on Sunday). In terms of the terrain, the forest we ran in this morning was rough, green, marshy and hard to run in a straight line. There is thick vegetation and low visibility, but despite all these bad points, it is actually really enjoyable and challenging to orienteer in. The sprint race is in an urban park area, with very steep banks and high visibility. The race will be very fast, with route choice paramount. This is the first chance I have had since Tiomila to write anything about it, I have had a really busy week with travelling back from Sweden, catching up with Liis, catching up with sleep, and then preparing for Estonia. Tiomila was an awesome experience, and I highly recommend it to anyone who has not been. I watched the junior and women's races on the internet from the hotel, and then fell asleep before the start of the mens relay. 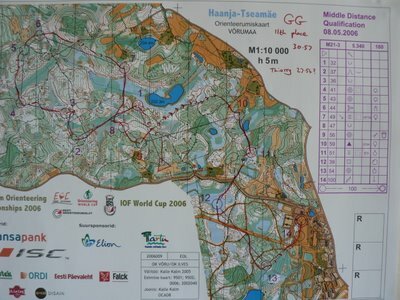 The original plan called for me to run leg 9 for my club, IL Tyrving. 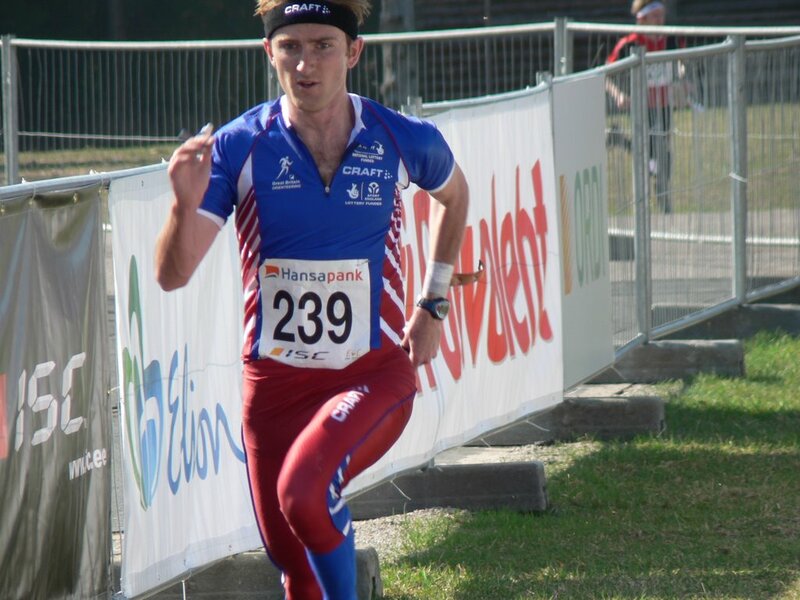 Unfortunately our best runner, Audun Weltzein, had to pull out at the last minute with a cold, so it was all change. That meant I now was running leg 10, and due to television committments, I wouldn't know how far I would be running until the morning itself. 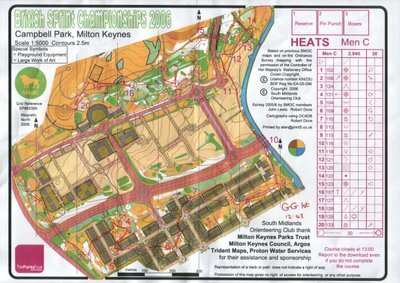 I was woken at 4.30 to be driven to the event in time to warm up, check out the layout and run, with a little time to spare. Unfortunately our leg 2 runner had had a bit of a disaster, and had lost quite a lot of time, and despite some good runs by our other legs, we were well behind our estimated times. Therefore I only started running at about 9am. 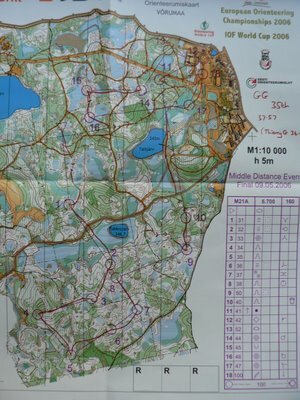 The course was set at 14km, and I was fairly nervous. 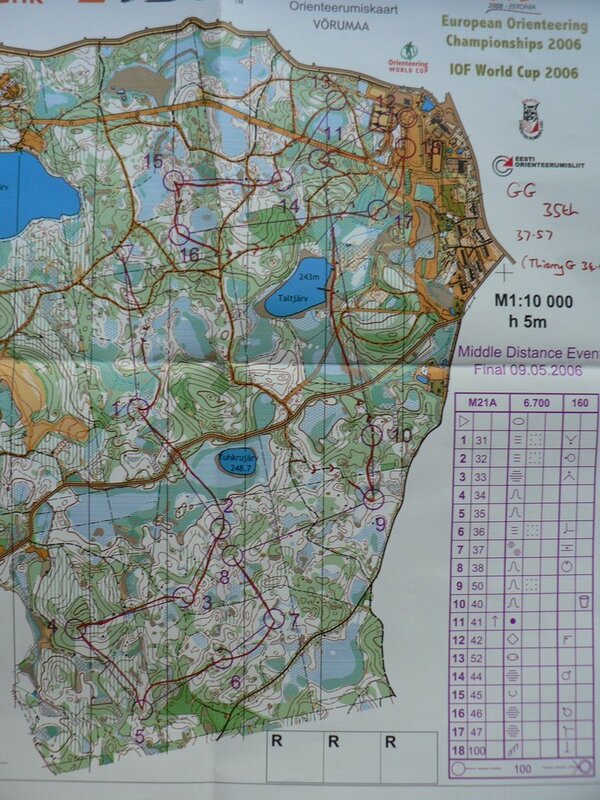 I started just behind Halden 2nd team, and caught them up on the way to the first control. I really enjoyed the fast open forest, and the more technical areas broke it up nicely. 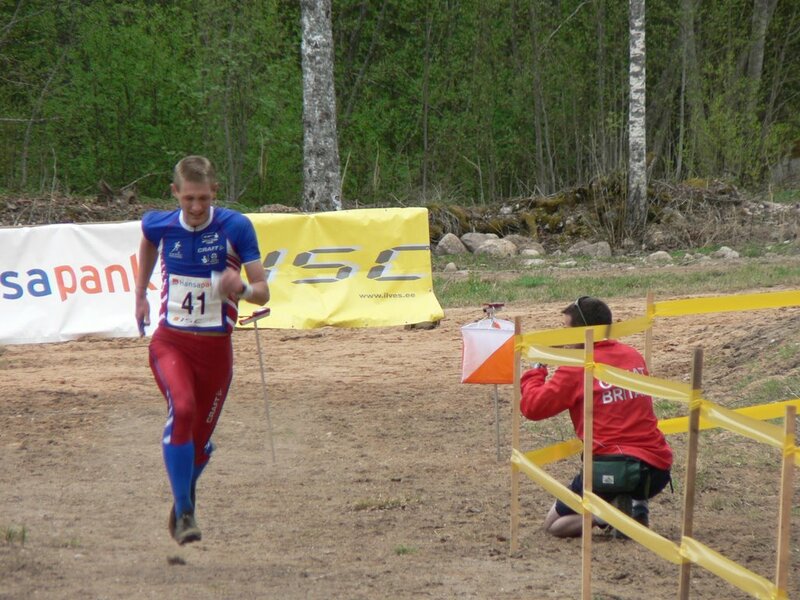 I was running very well, and had even pulled away from the Halden runner slightly when Mattias Merz caught us both up. Both of us tried to stay with the flying Merz, and I managed for about 3km before I had to give up. That took me round to the spectator control, and I was still running well. After that though, I started to tire, I wasn't running with anybody any more, and worst of all, I started to get stomach cramps. I simultaneously wanted to throw up and empty my bowels. I kept going, but I was losing concentration and made a stupid 2 minute mistake, and my speed was dropping off too. I managed to pull it together by the end to beat in a couple more teams, but the splits show that at the spectator control Merz had caught me by just over a minute, but after that he took another 6 minutes out of me over 5km. After the race I still felt awful and it took about an hour for my stomach to settle down. We finished in 48th place, and I pulled up 7 places, taking 35th best time on last leg. Pleasing performance up to a point, but ultimately quite disappointing, both for myself and the team as we know that both could have done better.